In case you all haven’t heard yet, Jeri Ryan will be doing voice over for the Delta Rising Expansion! This is pretty big news as we had only heard up until this point that Garret Wang would be doing voice. The thought of having Garret was pretty cool seeing as how it was hooking him back up with Tim Russ, the man behind the Vulcan Tuvok. Now news has broke that Jeri Ryan will be joining them! Not only that, but the icing on the cake is Ethan Philips aka Neelix and Robert Picardo also known as The Doctor – the Emergency Medical Hologram will also take part. It is like a mini voyager reunion and I couldn’t be more excited! I know people often knock Voyager, but I thought it was a pretty good show and I really enjoyed it. Who knows? Maybe seeing so many people returning to do voice over will inspire Kate Mulgrew, Robert Beltran, Roxann Dawson, and Robert Duncan McNeil to return as well! It would be amazing if we could get the entire crew together. That would be, in my yes, the ultimate trek gaming experience. 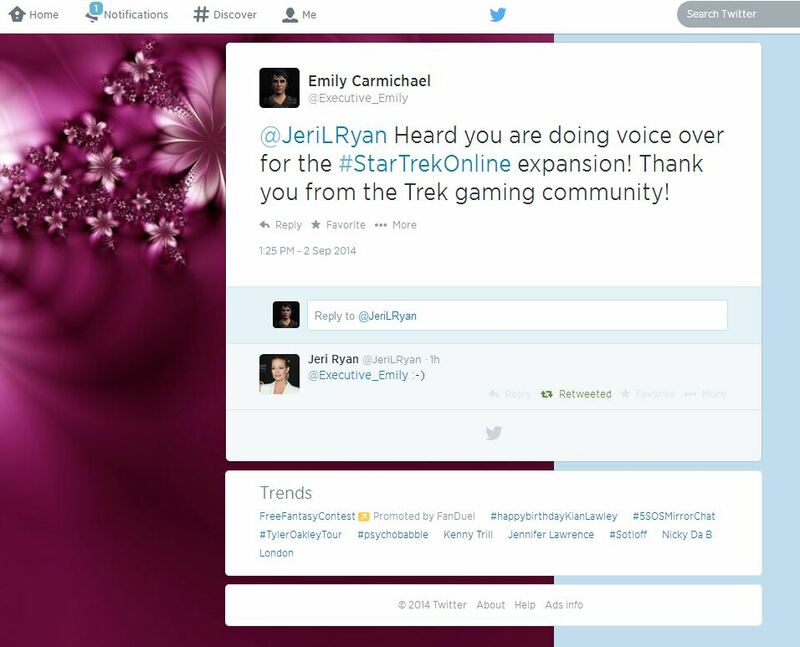 Oh, and also…Jeri Ryan tweeted back to me. Don’t worry, I am not fangirling here. I just thought it was kind of neat that she responded. Was just a smiley face, but still pretty cool. For the news release from Cryptic Studios about the cast of Voyager, check out the article here. For the tweet from Jeri, click here! Or just look below. If you check out the tweet, give her a retweet to let her know we appreciate her sticking with the trek fans. Looks like it’s time to send Picardo a tweet as well!